How Do I Get Information On My Immigration Case From USCIS? Orlando immigration attorneys and Jacksonville immigration attorneys know the frustration of the Infopass system. Appointments are few and far between. When an appointment becomes available, there is a mad rush to reserve your spot. Clients often get frustrated that an appointment cannot be made more quickly. And once an appointment is finally made, the answers are often not very useful. There are few agencies that are more tightly wound in red tape than the United States Customs and Immigration Services (USCIS). You can’t just pick up a phone and give them a call. You can’t simply drop in and ask a question. There is a process. Not a very good process. But there is a process. If you have a question about your pending application or petition, you can set what is called an “Infopass appointment.” An Infopass appointment is the vehicle you can use to get answers to your questions. Unfortunately, you will often get vague or conflicting answers, but sometimes these appointments can be very helpful. The most common use of the Infopass appointment is to answer the question, “What is taking so long on my application or petition?” Customers often ask when a decision will be made. Sometimes, simply having the Infopass appointment can jog the case the loose and get it back in line for a decision. The adjudicator who you meet with at the Infopass appointment won’t be the adjudicator that decides your case, but they often can look up the status in the system, see where the file is, determine where in the process the case is, and offer other useful information. You can get more information on the Infopass system at USCIS’s website page devoted to Infopass. Infopass is free and you can schedule your appointment online. 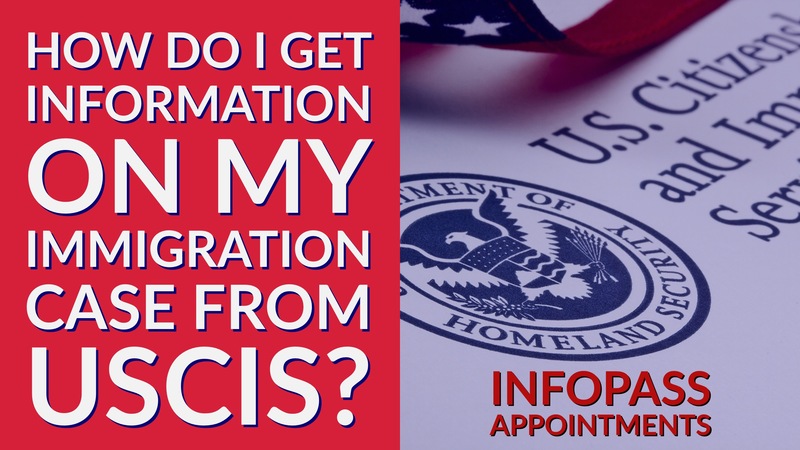 At your scheduled appointment time, you would go down to the USCIS office and check in. You’ll be given a number and once your number is called, you would meet with a USCIS adjudicator. You would ask that adjudicator your questions and they will answer the questions within the parameters of the USCIS policy manual. Don’t forget to bring your Infopass appointment letter, government ID, and any USCIS documentation that you have. An alternative to the Infopass appointment is USCIS’ 1-800 number. You can call 1-800-375-5283 if you have a very basic routine question. These representatives cannot provide as much information as an adjudicator at an Infopass appointment and it is often better to meet with an adjudicator face to face than to call the 1-800 number, but you certainly can try the 1-800 number first and then get an Infopass appointment if your question wasn’t answered by the call. Click the link to schedule an Infopass appointment. If you have an immigration attorney, make sure you contact them first. They may be able to answer your question or they may be able to schedule an Infopass appointment and go to the Infopass appointment for you. You also can check your case status by entering your receipt number. This tool will give you very limited information, but it can be helpful to know if your case has proceeded to an additional step in the system.